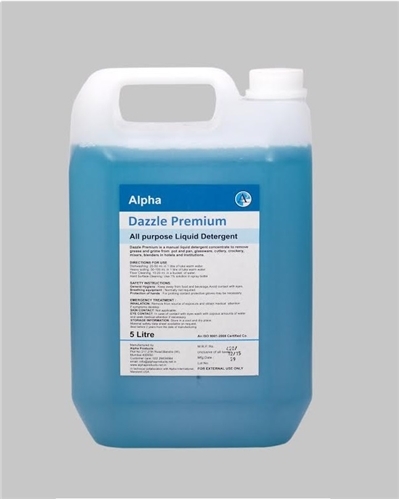 DAZZLE PREMIUM is a manual liquid detergent concentrate removes grease and grime from pot and pan, glassware, cutlery, crockery, mixers, blenders in hotels and institutions. Dish washing: 20-50 ml. in 1 liter of luke warm water. Heavy soiling: 50-100 ml. in 1 liter of luke warm water. Floor Cleaning: 10-20 ml. in a bucket of water. Hard Surface Cleaning: Use 1% solution in spray bottle. General Hygiene: Keep away from food and beverage. Avoid contact with eyes. Breathing equipment: Normally not required. Protection of hands : For prolong contact protective gloves may be necessary. INHALATION: Remove from source of exposure and obtain medical attention if symptoms develop. EYE CONTACT: In case of contact with eyes wash with copious amounts of water and seek medical attention if necessary. STORAGE INFORMATION: Store in a cool and dry place. Best before 2 years from the date of manufacturing.